Charlie and Jim met at the University of Georgia. As good college students tend to do, they bonded over a common love. Whiskey. After a good deal of talking and enjoying single malts, Irish whiskey, bourbon and some rye, it became clear to the two what the next step should be. Create a whiskey of their own. And American Spirit Whiskey was born. Basically these guys take about 60% fine bourbon-quality “white dog” and add in 30% rye, then some barley . 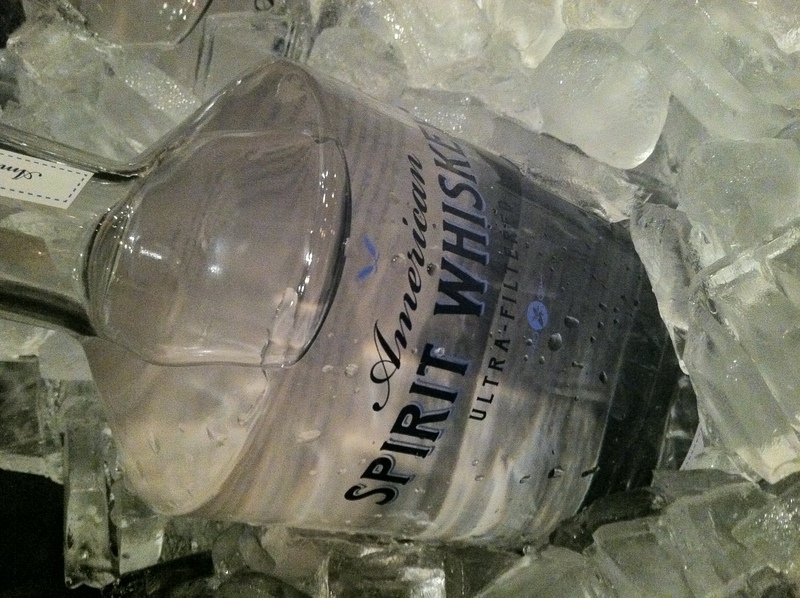 It is “ultra-filtered” to smooth out the usual harsh bite of white whiskey. Imagine that at one end of the spectrum is harsh, un-aged corn mash and at the other end is a smooth silky vodka. ASW white whiskey falls somewhere in the middle. I first tried it neat, bracing myself for the raw, edgy taste associated with white whiskey. What a surprise! Smooth, refined, and easy to sip. Add a small chip of ice and the flavors open up beautifully. It’s true that this is a versatile whiskey. Easy to enjoy alone, but a fresh addition to traditional cocktail recipes and new creations. I brought a bottle home to the lab and first tried mixing up a traditional White Manhattan – white whiskey, Benedictine, Dolin blanc vermouth, orange bitters. The result was a surprisingly smooth cocktail, refined and worthy of being served in a martini glass and not a mason jar. Since this was my first time working with white whiskey, I wanted to try a “lighter” end idea to see how well the ASW blended. I was in the mood for a sour and had a crate of fresh eggs, so why not try my version using the ASW. 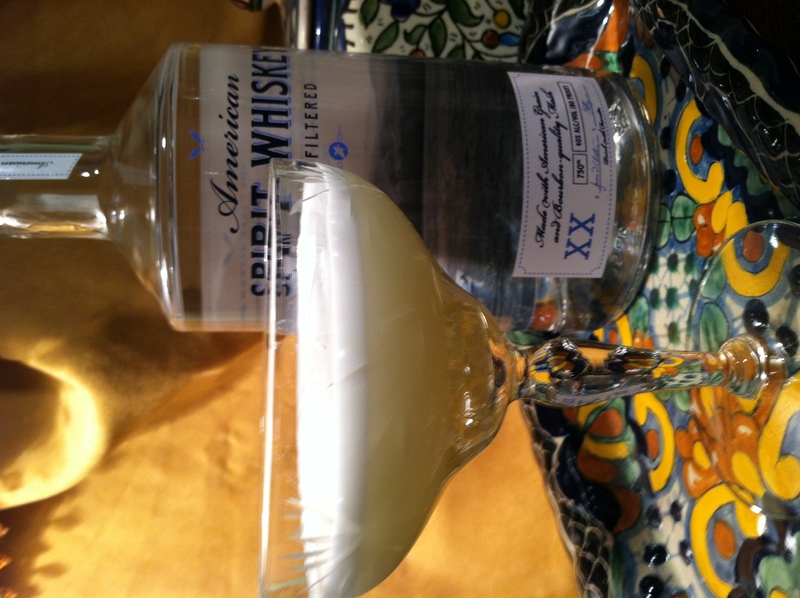 The white whiskey provides a nice foundation for a sour and does not overwhelm. Both of these recipes turned out so well that I enjoyed one or two each night this week! Place all the ingredients (except the bitters) in a shaker with no ice. Dry shake. Then add ice and shake violently. Strain into a coupe and sprinkle with a bit of cherry bitters. Place all the ingredients (except the bitters) in a shaker with no ice. Dry shake. Then add ice and shake violently. Strain into a coupe and sprinkle with a bit of peach bitters. You can purchase your own bottle at several of our favorite shops – Five Points Bottle Shop (Athens), H&F Bottle Shop, and Tower Beer and Wine. Check the ASW site for a long list of locations. Cocktails using ASW are being served up across Atlanta at fabulous cocktails spots including Empire State South, Flip, Family Dog, H Harper Station, Holeman & Finch, Local Three, and Woodfire Grill. If you have your own collection of whiskey at home, we encourage you to add this to your shelf. Special thanks to Melissa Libby and Associates, and to the folks at Latitude for the introduction to American Spirit Whiskey. Next Next post: Mamie Yes, Mamie No?